Variety is reporting Disney is enlisting Earth’s Mightiest Heroes as the company prepares to launch its upcoming streaming service. The entertainment giant is in early development on an ambitious plan for a number of limited series centered on popular characters from the Marvel Cinematic Universe. These series will likely include shows centered on Loki and the Scarlet Witch, along with other beloved superheroes who have yet to appear in their own standalone movies. Marvel and Disney had no comment. There’s an important distinction from other Marvel small screen efforts, however. 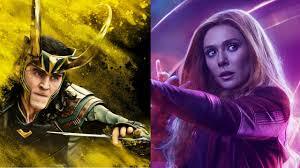 The actors who portrayed these heroes and villains in the Avengers films and their spin-offs, such as Tom Hiddleston and Elizabeth Olsen, are expected to play them in the streaming shows. Moreover, though sources close to the production are staying mum on the cost of the programming, the budgets are expected to be hefty rivaling those of a major studio productions. Each series is expected to include six to eight episodes. Marvel Studios will produce the shows and Kevin Feige, the guru of all things MCU, is expected to take a hands-on role in their development. The pricey gamble with one of the crown jewels of the Disney film empire is a sign of how much the company has riding on its direct-to-consumer platform. As companies such as Netflix and Amazon continue to grow their user base, Disney is trying to find a way to establish a toehold in the streaming revolution upending Hollywood. The company has kept the details of the service close to the vest, beyond saying that it will likely cost less than Netflix and will launch at some point in late 2019. Many of these projects are expensive bets. The Star Wars series will reportedly cost $100 million and the movies are expected to carry budgets north of $25 million. However, Disney has to spend big to make an impression. Netflix, its main rival, has 125 million subscribers globally and has lured top talent like Ryan Murphy (“American Horror Story”), Kenya Barris (“Black-ish”), and Shonda Rhimes (“Grey’s Anatomy”) to its platform with record-setting deals. The Marvel series are in early development and writers have yet to be attached to the projects. Marvel TV Studios and Disney have been active with shows that include ABC’s “Agents of S.H.I.E.L.D.” and Netflix’s “Daredevil,” but sources say those shows will stay under Marvel TV banner with these limited series set under Marvel Studios. Storylines for each series are still being teased out, but Disney appears to be holding back some significant fire power for the big screen. Insiders stress the Avengers that have gotten their own movies like Iron Man and Captain America will not be featured in the series with the studios focusing on characters who have served as second tier characters in the MCU. When all is said and done, the Avengers shows could be the streaming service’s most ambitious project both in terms of their scope and budget. Most important, it gives the service something that will attract comic book fans and represents the type of content Netflix would love to get its hands on.